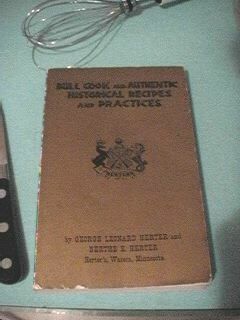 The full title is Bull Cook and Authentic Historical Recipes and Practices, by George Leonard Herter and Berthe E. Herter. Copyright 1969. While the rest of the world was protesting the war in Vietnam, the Herters were protesting the poor state of cooking everywhere except in Herter’s kitchen. In Palm Springs today, a few aging so-called Hollywood stars are making a last feeble effort to ruin a town. They bilked the public out of billions of dollars, yet will not let Palm Spring citizens even tell you where their homes are. They are gods, you know, in their own small minds.... The President of the United States always lets people know where he lives but these show world punks are too self important to let the public, that gave them every penny that they have, have even a look at where they live.... If Palm Springs could get rid of the old movie and television self-styled tin gods, it would be a fine resort area. For your convenience I will start with meats, fish, eggs, soups and sauces, sandwiches, vegetables, the art of French frying, desserts, how to dress game, how to properly sharpen a knife, how to make wines and beer, how to make French soap and also what to do in case of hydrogen or cobalt bomb attacks, keeping as much in alphabetical order as possible. No, it actually does have good recipes inside, and most of them are simple. Boil egg noodles until done and drain off the hot water. Fill with cold water and drain again to remove loose starch from the noodles. Add butter at the bottom of the pot and add crumbled Roquefort cheese to melt in the noodles. Stir over a low heat until evenly distributed. Recommendation: Quirky. You know you want it. If you enjoy cookbooks, you might also be interested in A Concise Encyclopedia of Gastronomy, Cavalier Cooking, Classic Chinese Cuisine, Cooking the Bahamian Way, Country Commune Cooking, Life, Loves, and Meat Loaf, The Art of Korean Cooking, The Casserole Cookbook, The Complete Book of Oriental Cooking, The Complete Bread Cookbook, The Frugal Gourmet Celebrates Christmas, The Healthy Cuisine of India, The New Larousse Gastronomique, Saucepans and the Single Girl, The Northwest Cartoon Cookery, Good Food From Mexico, Laurel’s Kitchen, The Cooking of Vienna’s Empire, James Beard’s Fireside Cook Book, French Bistro Cooking, A Fifteenth Century Cookry Boke, Crockery Cookery, Southern Cooking, The Frugal Gourmet Keeps the Feast, The Fannie Farmer Cookbook, French Cooking Simplified With a Food Processor, In Good Taste, Heritage of America Cookbook, Our Favorite Hometown Recipes Vol. II, The Indian Spice Kitchen, Japanese Country Cookbook, La Cuisine Française, Larousse Treasury of Country Cooking, The Natural Foods Cookbook, A Russian Jew Cooks in Peru, Soul Food Cook Book, The Tassajara Trilogy, Pains Spéciaux & Viennoiseries, Whole Earth Cookbook, The Wok: a chinese cook book, Southern Living Cookbook for Two, Lebanese Cuisine, The Art of Syrian Cookery, Popular Greek Recipes, In a Persian Kitchen, The Art of Pennsylvania Dutch Cooking, and The Southern Living Cookbook Library. Author of the Bull Cook series and other outdoors books. Co-author of the Bull Cook cookbook. Bull Cook Historical Recipes last modified May 25th, 2009.